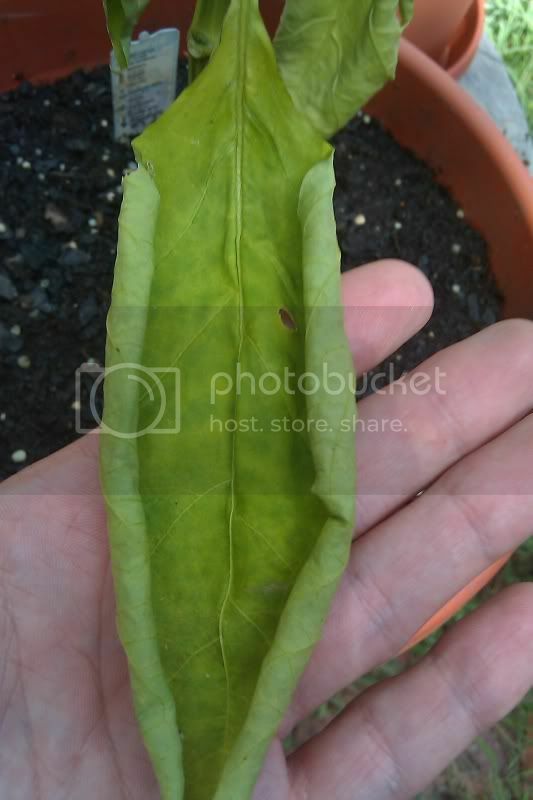 Bell Peppers - Weak and Droopy Leaves that Curl - Halp! Hello, I apologize if this is an incorrect way to introduce myself, but I recently started some light home veggie gardening using pots for the first time in my life:P. I started out with Sweet Basil, Better Boy Tomato's, Green and Red Bell Peppers. My Basil has grown GREAT, Tomato's not as much. Growing strong but no Tomato's have sprouted (maybe started too late) - My Bell Peppers however up until recently were doing great! I say recently becuase in the last 2 weeks they have gotten progressivly weaker as the days have gone by. I started out with 8 inch pots, using Miracle Grow Organic potting Soil. I Also used Miracle Grow Liquid PLant Food within this past 2 weeks. 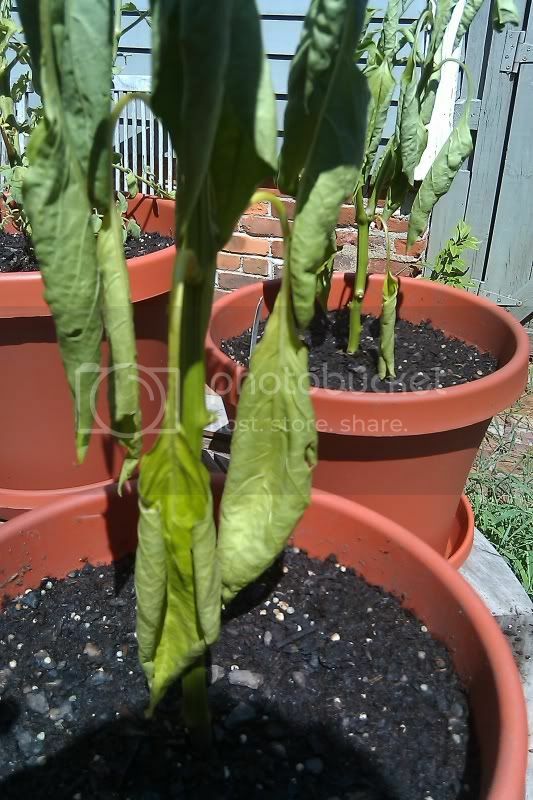 I noticed a strong smell coming from the pots last week as the leaves started to droop. I looked to the overflow opening under the pots and saw a residue starting to form. I over the last few days have been trying to keep the water clean and yet the smell and the filmy milky buildup continued. 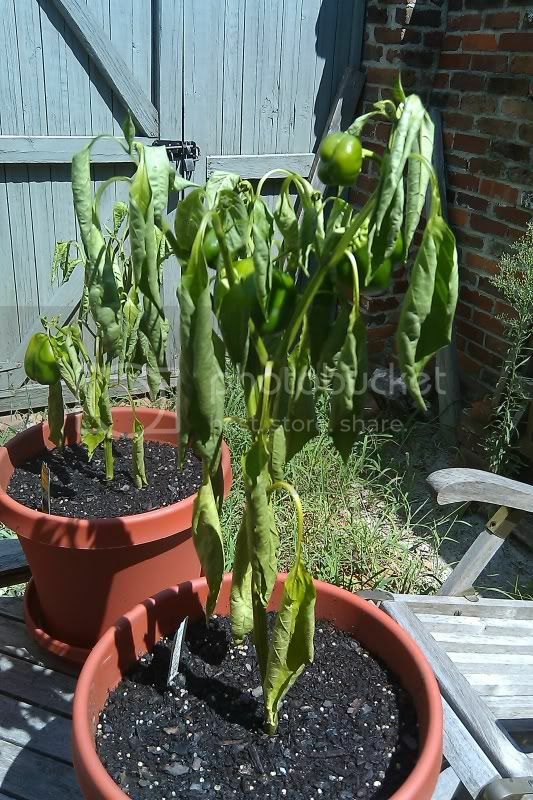 I finally decided to repot (something Id planned to do anyway) as my plants had started to get a little too big for the pots I had them originally planted them in and in hopes of seeing if the roots on my Bell Peppers had been rotting due to over watering. I cleaned out the bottom of the B.P.s, replanted in fresh soil (Same kind as original) yesterday and included some mineral/plant food Id purchased (non liquid ). I am hoping what I did will resolve the issue. It has been pretty hot the last few weeks (90-100 F.). I also have been liberally watering them ( too much Im starting to think after finding stagnant water in the overflow under the pots) but plan on easing that up since seeing the rot underneath. I am including pictures becuase I was hopeing the community might have some insight or advice on the issue. I don't want to lose my plant so any recommendations based on my descriptions and pictures would be welcome! My Green has 1 nice growing pepper, my red has several fruits of various sizes. Thanks in advance! It looks like a case of too much water, or the plants are rootbound....can you put them into larger containers with more soil? Well, first off, welcome the the Helpful Gardener forum . I'm thinking the same things as EG. When you up-potted them, were the roots wrapped around the inside of the pot (outside of the root-ball)? Also, ease up on the watering, give the soil a chance to dry out. Have you noticed if your potting soil is well-draining or poor-draining? Let us know how they come along. Are they in full sun all day? 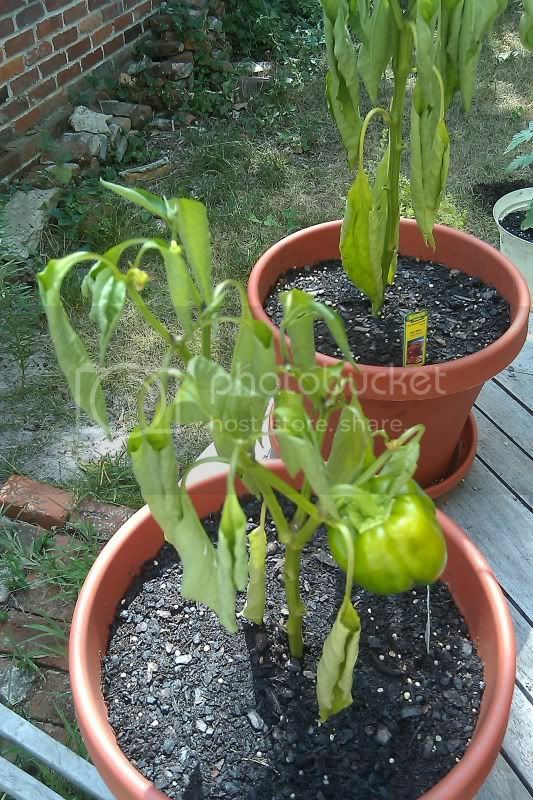 I find that my bell peppers do better with partial shade and good indirect light, especially in the heat of summer. Try watering less and don't over fertilize. Those peppers look like they got cooked in the heat. My bell peppers always look like yours by the end of a hot summer. They look that way in the evening, but perk up overnight. 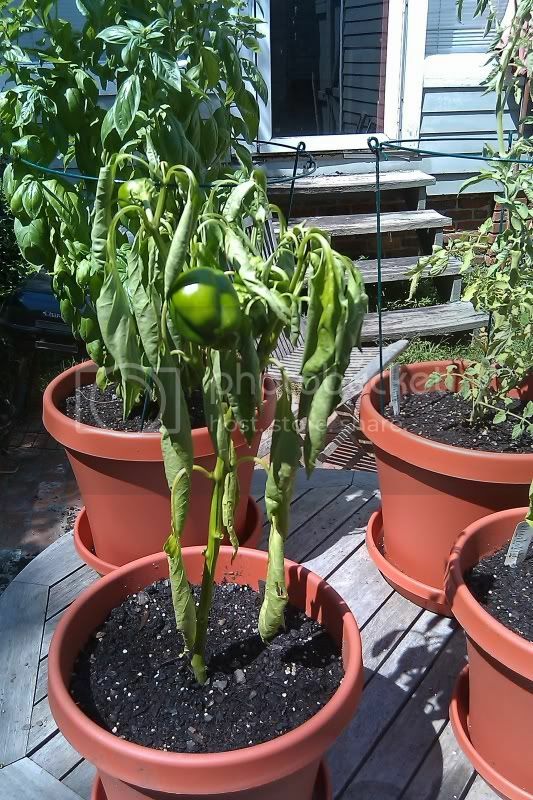 It has always seemed to me that hot late summer is not good for bell peppers. Early spring into mid June is great. They produce a lot of good sized peppers and start drooping in the high heat. Mine are planted in the soil instead of pots. My Sweet Cayenne looked like that, then it started to get a little better with the leaves a little more perky but still curled, then all the peppers it produced were maybe an inch long before turning red, then all the leaves started to go brown on the tips, it is turning around after i have been slowly plucking all the diseased leaves. I don't know what I did to my Red Beauty plant, but it is going mad, It is about 3 feet tall and I counted 8 Peppers growing (largest being about the size of a ping pong ball) and over 50 buds still forming.. That seems mad to me for a bell plant. If it's the heat that's getting to the plant, try putting up some shade cloth (really thin fabric) during the hottest part of the day. garden5 wrote: If it's the heat that's getting to the plant, try putting up some shade cloth (really thin fabric) during the hottest part of the day. I did the shade cloth thing last year and it worked.